From Hansard. Go page 3 out of 16. 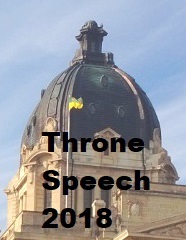 The Speaker: — The Chair recognizes the member for Biggar. Wherefore your petitioners humbly pray that your Hon. Assembly may be pleased to cause the government to take the necessary steps to ensure that the Biggar Hospital, long-term care home, and ambulance services maintain at the very least their current level of services. Signed by the good citizens of Biggar and district. I so present.